More student housing, another hotel or office spaces, are just three proposed uses of Lincoln’s Tentercroft Street in a new report. 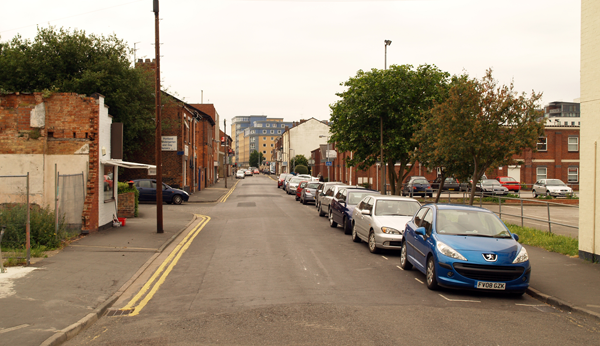 Tentercroft Street is earmarked for redevelopment if the proposed East West road link gets the necessary funding and it is built. The three landowners on the street, Lincolnshire County Council, City of Lincoln Council and Lincolnshire Co-operative, commissioned Globe Consultants to write a “feasibility study” into potential uses for the area. Other suggestions include a multi-storey car park and community centres, such as a library. The report notes that community-focused uses for the area are “only viable if commercial values are achieved”. Globe anticipates that commercial use of the land gives it a Gross Development Value of £69 million. However, it would cost £57 million to develop the site to reach this potential. Currently, it estimates the site’s worth at £10 million. According to the report’s conclusion: “The most financially advantageous approach to this site in the short term is to maintain the status quo: car parking produces the highest revenue and establishes the site’s current value. “However, there is a clear expectation that, looking forward, this well-located site should deliver more than just the best immediate financial income. Its development has the clear potential to deliver a range of economic, social and environmental benefits and it may be considered that maximising the delivery of these is an equal or overriding objective. The proposals will be discussed at Lincolnshire County Council’s next Economic Scrutiny Committee on June 14.